FILE - In this undated file photo released by a militant website, which has been verified and is consistent with other AP reporting, militants of the Islamic State group hold up their weapons and wave its flags on their vehicles in a convoy to Iraq, in Raqqa, Syria. Ideology is not the main reason that some people in the conflict-ridden Arab world join extremist groups. Rather, a host of other issues, including political participation, poverty, income disparity and unemployment, push people toward violence and extremism, a panel of experts said Thursday. "The mainstream population [in the Arab world] is poor and vulnerable. Decisions to survive and provide for the family, not ideological beliefs, lead to people joining extremist groups," said Rami Khouri, a professor of journalism and public policy at the American University of Beirut. Khouri added that in addition to tackling poverty, inequality and economic disparity, environmental factors such as shortage of water and drought must not be ignored when solutions are sought to end conflicts in the region. Mehran Kamrava, a professor of international affairs at Georgetown University in Qatar, argued that while addressing poverty is key to resolving conflicts in the region, the fight against poverty could not be won unless it was coupled with creating economic opportunities for people through sound economic policies and strengthening the education and development sectors. He argued that they all go hand in hand. "Education by itself cannot resolve issues unless there is a political system that allows people to express themselves. Adding to this is providing people with work opportunity and improving their livelihood," Kamrava said. 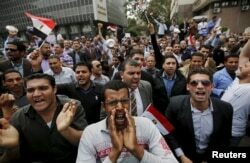 FILE - Unemployed graduates shout anti-government slogans during a protest to demand that the government offer them jobs, in front of the parliament headquarters in Cairo, March 27, 2016, where the nation's prime minister was speaking. The Washington-based Arab Center organized the panel discussion, which focused on the future of the Arab world. Amatalalim Alsoswa, a Yemeni activist and the country's former ambassador to Sweden, Denmark and the Netherlands, pointed to religion's role in solving some of the regional problems. "Religious faith has always been an integral part of the culture in the Arab world and will continue to be in the future. The problem here is [lack] of tolerance for opposing views and assuming that one's own religion or sect is the only true one," Alsoswa said. Alsoswa added that if utilized properly, religion could play a positive role in promoting ideals such as tolerance of others, social justice, good governance, equality of citizenship, women's rights and civil rights. The Arab world "continues to suffer from a deadlock of past grievances. But it is not too late to build on the rich heritage of the region to bring change. Such change requires government systems that promote the path forward," she said. Thomas R. Pickering, former U.S. undersecretary of state for political affairs, echoed parts of Alsoswa's assessment, adding that local knowledge of the region and its history was crucial. "America has a deficit in its knowledge of Islam and the Arabic-speaking world, and as a result we are making mistakes," Pickering said. "It is important to rely on people who have the knowledge of the region."